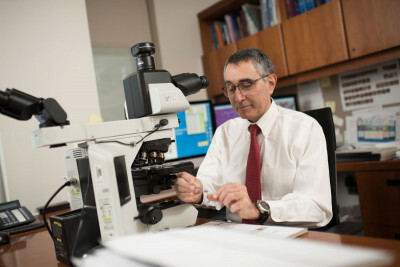 MSK experts in pathology like Ahmet Dogan, Chief of the Hematopathology Service, analyze lymphoma cells from biopsies to make precise diagnoses and help design personalized treatment plans. At Memorial Sloan Kettering, we use the latest techniques and state-of-the-art equipment to identify and characterize even the most uncommon forms of lymphoma. Make an accurate and comprehensive pathologic diagnosis. Define the extent and clinical features of your lymphoma (including the stage). At Memorial Sloan Kettering, our pathologists are highly skilled at correctly identifying the type of lymphoma you have. Because there are more than 70 different types of lymphoma, this expert pathology review is crucial for making the right diagnosis. Our doctors use the latest molecular and genetic information to identify rare lymphomas that most pathologists will never see. During a surgical biopsy, a doctor makes a small cut in the skin and removes part or all of a lymph node or a piece of diseased tissue. During a core needle biopsy, a doctor inserts a hollow needle into a lymph node or tumor to remove a small amount of tissue or fluid. Our interventional radiologists have extensive expertise in this approach. Our experts examine the biopsy tissue under a microscope. They do this to look for an abnormal appearance in the lymphocytes. We perform additional tests using advanced technologies to establish a diagnosis of lymphoma. Then we define its unique subtype and genetic “fingerprint.” We also look for characteristics that could predict how the lymphoma will respond to specific therapies. This lets our doctors create a personalized approach for each patient. Before your treatment starts, we perform a physical exam. We may also do imaging tests, including PET, CT, and MRI scans, to determine how much lymphoma you have and where it is located. In addition, a bone marrow biopsy and/or laboratory testing of your blood may help us determine the extent of your lymphoma. Using this information, we can determine the stage of your disease. The stage of lymphoma you have refers to how far the disease has spread through your body. Lymphoma that is in only one lymph node or organ is considered to be at an early stage. Lymphoma that has spread to several lymph nodes or organs is in an advanced stage. It is important to remember that for some types of lymphoma, knowing the stage alone does not provide enough information. In these cases, other factors can give doctors a better idea about your prognosis. In addition, the same stage number means different things for different cancers. For example, even patients with advanced lymphoma (stage IV) can still be treated and cured in many cases.